Im not quite 30 years old, but technologically speaking, I feel like a dinosaur. In an age when I can download almost any song or album I want, Id rather visit my favorite record shop after work on Friday and sift through the stack of new arrivals to see what treasures are being pressed on vinyl. When I was saving money last year to buy a turntable, it seemed everyone around me already owned an iPod. More times than I can remember, friends asked, "Do they still sell records?" The way I collect music makes me an outlier among my peers. A friend visited recently and commented that my stereo sounded good for a two-channel system. It was the first time Id heard someone apply a caveat to stereo, as if it were obviously inferior to surround sound. I realize now that, in a 5.1-channel world, some people consider two-channel sound a compromise. Clearly, something needs to be done to change that perception. Im a firm proponent of a simple, good-quality, two-channel system for music playback. This is partly due to the number of high-quality, superb-sounding integrated amplifiers Ive reviewed. For as little as $500, its entirely possible to buy a musically pleasing integrated amplifier that can be enjoyed for many years. If a buyer can spend more -- say, $3000 to $4000 -- he or she can own a component that will compete favorably against high-end separates with very little compromise in performance. This is the world of a product such as the subject of this review, the Stello Ai500 integrated amplifier ($3495 USD), which comes from April Music of South Korea. April Music began making audio components in 1998. Before that, owner Simon Lee had imported high-end audio gear into Korea. Over time, Lee had grown unhappy with the escalating prices of audio products whose performance was not on a par with their cost, and had decided to introduce a line of audio components that would compete with other high-end brands, but at reasonable prices. Today, April Music makes several product lines; in ascending order of price, these are: the affordable but very chic Aura products (including the Model One speakers), the Stello 100 series, the more upscale Stello line, and the state-of-the-art, cost-no-object Eximus series. Based on the praise Lees products have received from SoundStage! Network writers and others, hes been very successful at meeting his objective. In his Stello line, Lee has attempted to offer much of the performance of his Eximus products at considerably lower prices, and the Ai500 integrated amplifier is a perfect example. Built as sturdily as any integrated amplifier Ive ever seen (including some that cost thousands more), its the type of component youll be happy to display in your equipment rack; its gorgeous, brushed-aluminum finish and soft curves will make it at home in any contemporary setting. When I first pulled the Stello from its box, I was struck by its weight. At 35 pounds and measuring 18.1"W x 3.4"H x 15.7"D, the Ai500 is a substantial piece of kit, due in large part to the oversized 800VA toroidal transformer and 90,000mF of capacitance it uses to generate the enormous amounts of power its claimed to output: 150Wpc into 8 ohms or 300Wpc into 4 ohms. With numbers like these, the Ai500 seems ready to power just about any speaker youd ever want to partner it with. Its class-A/B output stage uses matched Hitachi MOSFET power transistors in a push-pull configuration that, in conjunction with careful ground-isolation techniques, are said to ensure a high signal/noise ratio. The Ai500s rear panel boasts numerous inputs for connecting your entire system. In addition to one set of Neutrik balanced inputs are three single-ended inputs: one each for a CD player, tuner, and an auxiliary component such as a phono stage. A Bypass input sends the signal directly to the amplifier stage, allowing the user to experiment with external two-channel preamplifiers, or to use the Ai500 to power two channels of a home-theater system. Theres also a Record input for connection with a cassette deck. The Ai500 also comes equipped with a preamplifier output for use with an external power amplifier, either separately or in conjunction with the Stellos own power section. Otherwise, the preamp out can be connected to a subwoofer to augment the low-end output of a stereo pair of speakers. Another standard feature is an onboard digital-to-analog converter (DAC) that allows you to connect to the Stello the digital output of a CD or DVD player, or a computer. Three digital inputs are provided: coaxial, optical, and USB (16-bit/44.1kHz only). There are also analog and digital inputs for an iPod docking station. Using a USB control cable, its possible to scroll through the music on your iPod using the supplied remote control. However, since the iPod is connected with stereo analog inputs, the iPod itself converts its digital datastream to analog, not the Ai500s onboard DAC. Still, if your music is stored primarily on your iPod or the hard drive of your computer, Stellos Ai500 offers the most simple, direct means of playing it that I have seen in an integrated amp. The front panel has a clean, simple appearance. A small display tells you, in red text, which input is selected and the volume at which it is set. The displays brightness can be set to Low, Medium, High, or Off. Under the display is a row of buttons labeled (from left to right) Balanced, CD, Tuner, Aux, Digital, Bypass, and Mute. Volume is controlled with a large rotary dial at the far right that employs a Cirrus Logic CS3310 digital volume control, adjustable in increments of 0.5dB. The volume can be set and adjusted independently for each input -- a handy feature for a reviewer who wants to match gain levels to compare different components. The main Power button is on the far left. A full-function remote control is included. Made of aluminum, its divided into three sections: one for controlling the matching CDA500 CD player (as yet the only other member of Stellos 500 series), one for navigating the music stored on your iPod, and one for controlling the Ai500 itself. Every aspect of the Ai500s build exudes quality. From the quality of the connectors to the speaker binding posts (which accept bare wire, spade lugs, banana plugs, or pin terminals), April Music appears to have thought of everything to put in the Ai500 -- except for an onboard phono stage. That wont affect most listeners, but it will affect some, like me. 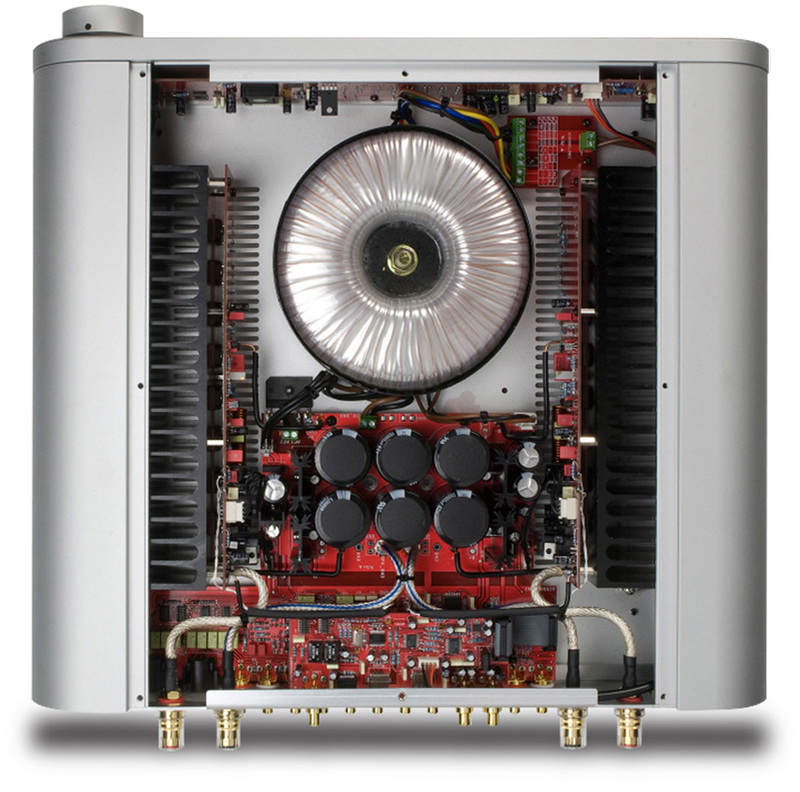 Still, the Ai500 exemplifies the flexibility possible in an integrated amplifier. But at $3495, the Ai500 needed to do more than just look good. I inserted the Stello Ai500 into a system comprising PSB Platinum M2 bookshelf speakers, an NAD C542 CD player, AudioQuest Type 4 speaker cables, and Kimber Kable Tonik interconnects. To test the Stellos DAC section, I connected the NADs digital output to the Ai500s coaxial input using an AMX Optimum AVC 31 cable. When I started listening to the Stello Ai500, it didnt make a huge impression. The sound wasnt bad per se; it just didnt jump out at me. In fact, I had a very difficult time trying nail down its sound at all -- it took me some time to realize that I was listening for something that wasnt there. The Stello Ai500 didnt really have a sound of its own. It was dead neutral. The trouble for a component that produces few or no sonic colorations is that a listener might ignore it in an audio showroom. It takes time to appreciate the fact that the lack of a sound of its own is actually a high-end components best possible attribute. This described my experience with the Ai500. When at last I stopped fretting over what to write about in the review and just started listening to music, I found myself picking up a pen and scribbling listening notes. This first happened when I placed in the CD tray my well-worn copy of Radioheads Kid A (CD, EMI 5 27753 2). As I listened to track 1, "Everything in Its Right Place," I was impressed with the size and coherence of the soundstage. From top to bottom, the Ai500 was one of the cleanest-sounding integrated amps Ive ever heard. Unless the recording itself was poor, the Stello provided an amazingly clear, wide-open view into the music. Ive never heard such crisply defined images outlined in front of me. As I continued listening to Radiohead, the horn section in "The National Anthem" was truly raucous, but the shrill screeches and blaring lines were wonderfully invigorating -- they certainly werent warm or fuzzy, but neither did they sound piercing or harsh. Rather, they remained clear and comfortable to hear, and even prompted me to turn up the volume. In fact, the Ai500 is the first integrated amplifier Ive heard since reviewing the Bryston B100 SST in 2006 (and which I ended up buying) that consistently had me turning up the volume -- everything that emerged from the speakers was more of what I wanted to hear, and I never felt the discomfort that comes when music is too loud. Of course, this isnt to suggest that the Stellos volume could be turned up indefinitely; sooner or later, things got uncomfortable. But when an amplifier sounds great at low volumes, and retains the same sonic virtues without added unpleasantness at higher volumes, its a very good sign. The clarity of the Ai500s sound meant that it was able to retrieve incredible levels of detail. The rattle of the tambourines metal plates during the driving rhythm of the apocalyptic "Idioteque," from Kid A, was as pristine as Ive ever heard. Even the sense of space around the instrument was tangible -- it sounded as if it were right in front of me. I dont recall ever hearing such minute detail so clearly, and that summarizes much of my experience with the Ai500. Detail never sounded forced or artificially highlighted, as though a spotlight had suddenly been shone on one aspect of the music. Sometimes a component will emphasize the highs, thereby exaggerating the level of detail in a recording. Not only can this become fatiguing over long periods, it also lends itself to a more analytical sound. The Ai500 was not analytical but eminently musical. Its ability to clearly delineate the voices of Elliott Smith and Rebecca Gates on "St. Ides Heaven," from Elliott Smith (CD, Kill Rock Stars krs246), was exceptional. The solidity and separation of their voices was beyond reproach; again, the musicians seemed to be in the room with me. The Ai500 consistently provided rock-solid, unwavering images across the soundstage. In fact, rock-solid seemed to describe its performance overall. I cant attest to whether or not the Ai500 met its specified power ratings -- I lack the appropriate test equipment -- and I was never close to pushing it to its limits, but it always had heaps of power, and gave me the feeling it had plenty in reserve. Unless you have a huge listening room, terribly inefficient speakers, and/or you play your music at volumes that wake the neighbors, its unlikely youll ever exhaust the Ai500s power capacity. Typically, a good power supply manifests itself in strong bass performance, and Im happy to report that the Ai500 was not an exception. Much like the rest of the spectrum, the low end sounded wonderfully detailed and clean, but it could also hit with plenty of impact, exhibiting some warmth and bloom in the process. On the Great Lake Swimmers "Backstage with the Modern Dancers," from Ongiara (CD, Nettwerk 30691 2), I could almost feel in my chest the thump of the kick drum as the Ai500 coaxed full, powerful bass from my bookshelf speakers 6.5" drivers. This was even more apparent with Massive Attacks "Angel," from Mezzanine (CD, Virgin 45599). The song opens with a bass line that isnt even audible through my speakers until a few seconds after it begins, so deep are the low frequencies. However, when they did start to become audible, I could feel them through my whole body as they radiated out from the speakers and into the room, flooding it with the dark murk characteristic of this superb trip-hop album. Overall, there was little for me to criticize about the Stello Ai500s "sound" -- or lack of it. Some listeners might want a little more warmth and bloom in the low end, while others may prefer a more forward, more immediate sound. Not I. This integrated amplifier struck the perfect balance between tonal neutrality, exceptional transparency, and explosive dynamics, the last likely due to its beefy power reserves. To my ears, the Ai500 is the best integrated amplifier to come along since the Bryston B100 SST -- which I discuss next. Standard equipment with the Ai500 is what Stello describes as "an ultra high performance digital-to-analog converter capable of elevating your computer audio files to true high-fidelity performance." Because I never listen to music directly from my computer (presently, only two CDs are copied onto the hard drive), I didnt test this claim, although I did play a number of CDs using both the NAD C542s DAC and the DAC aboard the Ai500. As I switched between the two DACs, the differences I heard between them could be described as ones of addition and subtraction. As I went from the NADs DAC to the Stellos, it was as if there was an added sense of space in the music -- as if the stage had opened up more in front of me. This made it easier to hear into the music, and gave the Stello a slightly better see-through quality. Listening to Spiritualizeds Ladies and Gentleman We Are Floating in Space (CD, Dedicated 07822-18974-2) through the Stello DAC, the stage just seemed to grow out to the sides as well as to the back. Returning to the NAD, it was as if the music had been scaled down and shrunken a bit. The two DACs bass performances were very similar -- both exhibited fully fleshed-out low frequencies. Here again, however, the Stellos bass was slightly firmer than the NADs, as I heard while listening to the bass guitar in "If You Could Read My Mind," from Gordon Lightfoots Complete Greatest Hits (CD, Warner Bros./Rhino WTVD 78287), which was a bit cleaner in its extension through the Stello. The differences between the NAD and Stello werent enormous. The NAD still achieves most of what the Stello does, although any disparities between them favored the Stello. If I owned a Stello Ai500, Id definitely choose its digital conversion over that of the NAD C542. However, the Ai500s DAC will probably be even more appreciated by listeners who store their music on a hard drive and want to improve the sound from their computers. Given that the Ai500s DAC comes standard, it gives the Stello a big edge over some of its competitors. Regular readers will know that Ive been a big fan of the Bryston B100 SST ever since I reviewed it three years ago. In fact, I liked it so much that I spent the year following that review saving up enough to buy one for myself. Ive spent considerable time listening to many high-end integrated amplifiers since I began writing for the SoundStage! Network, and during that time nothing has impressed me as much as the Bryston -- until now. The Stello Ai500 plays in the same league as the Bryston and, to my ears, improves on it in some areas. The Stello and Bryston are similarly priced. The basic B100 SST costs $2995; adding a remote tacks another $400 onto the price, while the optional onboard DAC costs an extra $1000. That brings the total cost of the Bryston to $4395 -- $900 more than the Ai500. I prefer Brystons remote because it fits better in the hand and is backlit. However, for $400, I would expect a remote control to be something special. In terms of power, the B100 cant quite match the Stellos 150Wpc output, instead delivering 100Wpc into 8 ohms, and not quite doubling that into 4 ohms, to 180Wpc. On paper, the Stello is the beefier integrated amplifier, although in practice power is not an issue for either design. If youre able to drive either into clipping, then you listen to music at far higher volumes than I do. I wouldnt buy one over the other based simply on power ratings. One respect in which the B100 has a clear advantage is Brystons famous 20-year, transferable warranty. Even if April Music cant go to that length, for $3495 they should give their customers at least five years of peace of mind, instead of the two they do offer. I spent considerable time listening to Great Lake Swimmers Ongiara, in particular "Backstage with the Modern Dancers," through both integrateds. Both created very wide soundstages across the front of my listening room, although the Ai500 was more adept at communicating a tangible sense of depth. The B100 wasnt bad in this regard, but with the Ai500 it was just easier to sense toward the back of the stage. In terms of transparency, both performed exceptionally well, providing the most see-through sound of any integrateds Ive ever reviewed. As I switched back and forth between them, the Stello seemed to convey detail with a touch more ease than the Bryston, but they were so close in this regard that a blind listening test would be the only way to confirm this observation. I dont anticipate that anyone will buy one over the other based solely on transparency. In the bass department, both the Ai500 and B100 sounded full and weighty, although the impact of the kick drum on the Great Lake Swimmers album was greater with the Bryston, with a bit more weight that provided a more visceral experience of the low frequencies spreading into the room. Bryston components have a reputation for strong bass; as good as the Stello was, it didnt match the Bryston in this regard. In the end, I found I preferred whichever integrated I was listening to at the time. This was a sure sign that both were performing to a very high level, and that Id be happy with either taking up residence in my listening rack. Prospective buyers will need to spend a good bit of time auditioning both before deciding which is right for them. Its taken a long time for an integrated amplifier to come along that Ive enjoyed as much as the Bryston B100 SST, but the Stello Ai500 has finally arrived, and with it, April Music has a clear winner on their hands. Although its not cheap, I suspect that significantly improving on its performance would require spending many multiples of its price, and in this sense the Ai500 offers excellent value. But more than that, the buyer of the Ai500 will be rewarded with an extremely high-quality, very flexible, and solidly built component that looks great and will give pride of ownership for years to come. To paraphrase what my friend said about my system, April Musics Stello Ai500 doesnt just sound good for a two-channel integrated, it sounds good period. Highly recommended.